The peony is a lush and fragrant bloom that is grown in many gardens. Two main varieties are available, tree and herbaceous, for plants. Both require similar light and growing conditions when outdoors. The blooms are widely used for cut arrangements around holidays. Blooms may be used on their own, or mixed with other bright flowers. Some select locations such as Hampton, VA, Vancouver, WA, Hialeah, FL, Spokane Valley, WA, and Providence, RI can have cut peony bouquets available for delivery. The live plants are also popular choices for vibrant flower gardens. 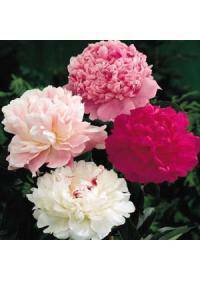 There are at least 30 known species of herbaceous peonies available. Some are native plants in North America, while others are cultivated. Hybrids have also been introduced to be more tolerant to climate. P. mlokosweitschii is best known as the Golden or Caucasian peony. Flowers are less ruffled, but have a creamy golden yellow color. Leaves are a lighter green compared to many of the other species. P. suffruticosa is a tree species that is native to parts of China. Blossoms are often a deep pink or rich red with vivid yellow centers. It can grow up to five feet tall and spread up to four feet across. Fall is the best time to add peonies to the garden or landscape. If plants are added in early fall, deeper roots can begin to grow. This will often lead to better growth and bloom the following year. Cooler climates are often preferred for many of the hybrids available. In some warmer or drier zones, a hardy species may need to be found. In some regions, tree peonies may be better suited to the climate. As a general rule, at least six hours of daylight is needed outdoors. A partially sunny location can be suitable for many landscapes. Some species may be more tolerant of shade but will bloom less. Tree peonies will flourish best with light shade from other trees. They should not be exposed to full sunlight for the entire day. As with full shade, full sun can diminish bloom frequency and quality. Soil must be able to drain thoroughly after watering or raining. Standing water can lead to rot that will quickly kill off plants. Drainage may need to be created for some areas of the garden or lawn. Peonies are one of the top flowers that are used around Mother's Day. The rich and ruffled appearance of many makes them a touching choice. They may be given as part of a cut flower bouquet or a potted plant. The flower often is used to symbolize riches and fortune for some. It may be combined with other blooms to mean good fortune or luck. Some may choose to use peonies to wish others good luck on something. The prosperity meaning can also be used for marriage anniversaries. They may be used to create arrangements for anniversary bouquets. In such cases, they can represent passion and prosperity in marriage. Bright pink peonies can be used to show love, passion and friendship. White peonies can be used to show sincerity and honesty or purity. Rich reds are typically chosen to show feelings of love or passion. Cut stems are often the most popular when it comes to giving blooms. They can be mixed with other flowers or given as a solid bouquet. The peony is a yearly favorite for many occasions and holidays.